STMicroelectronics have created an STM32 Nucleo pack for LoRa™ technology utilising a high-performance FSK/OOK RF transceiver modem. The P-NUCLEO-LRWAN1 development tool allows engineers to learn and develop solutions based on LoRa™ and FSK/OOK technologies. 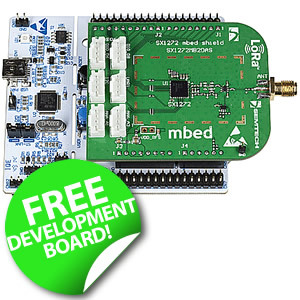 The P-NUCLEO-LRWAN1 development platform, in association with the certified embedded software solution (I-CUBE-LRWAN), provides engineers with the means to set up a complete class A compliant LoRaWAN™ node, based on the SX1272MB2xAS LoRa™ extension board. To control the LoRa™ extension board, the pack comes complete with a NUCLEO-L073RZ MCU board based on the ultra-low-power STM32L0 ARM 32-bit microcontroller. The I-CUBE-LRWAN embedded software solution is also LoRaWAN™ class A certified. The P-NUCLEO-LRWAN1 development tool is designed for use in all countries using the 868 MHz or 915 ISM frequency bands.